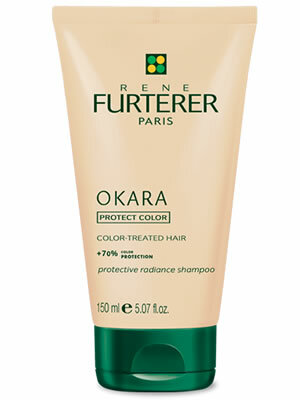 Rene Furterer Okara Shampoo is a highly protective shampoo proven to maintain 70% of color vibrancy while enhancing its intensity and radiance. A gentle cleansing base ensures additional color protection and helps resist fading. Hair is silky, soft and luminous. OKARA PROTECT COLOR is the first hair care system to include a Color Protection Factor (CPF), a measurement that evaluates the percentage of color protected when used in comparison to another shampoo.